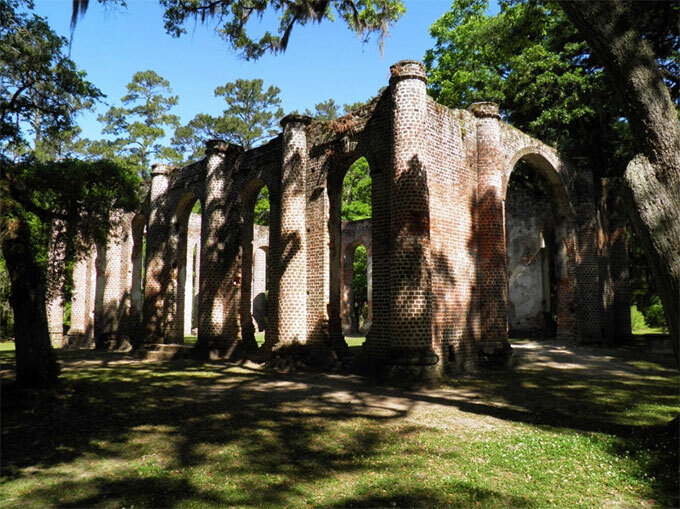 LOWCOUNTRY, SOUTH CAROLINA â€“ Located between Yemassee and Beaufort, this church, originally built in the 1750s, was burned by British troops during the Revolutionary War in 1779. Rebuilt in 1826 from the remaining walls, the church was burned again by Union forces during Sherman's "March to the Sea" in 1865. Even though the brick walls and columns were not destroyed, the church was never rebuilt. Itineraries for day trips to see other historic sites, including churches, Revolutionary War sites, museums and plantations, are available at the Lowcountry & Resort Islands Tourism Commission.